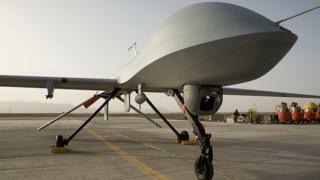 The US has admitted that a woman and child were killed by an American drone strike in Somalia last April. It marks the first time America has admitted to causing civilian casualties during its air campaign in Somalia. Only weeks ago, the US had denied claims by rights group Amnesty International that 14 civilians were killed in five separate raids. The US began an air war against al-Shabab militants in 2011 under the direction of President Obama. Since the election of Donald Trump, the number of strikes has risen sharply. According to official figures, 110 air strikes have been carried out against militants in the past two years. The US had earlier said that the attacks had killed 800 people, none of them civilians. But at a press conference on Friday, military officials said an internal review had been conducted following Amnesty’s report, questions from Congress, and a spike in strikes. The review was ordered by General Thomas Waldhauser, head of US Africa Command (Africom). It reportedly identified a “break down in reporting” which meant new information was not reported to Africom, leading commanders to make erroneous claims about civilian casualties. In a statement, Africom said the strike last April was not one of those flagged by Amnesty. It added that four al-Shabab militants had also been killed. “Trust and credibility are central to our operations,” said General Gregg Olson, Africom director of operations. The BBC contacted Africom and asked if any compensation will be given by the US for the deaths. In response, a spokesperson said Africom was “working with [the US embassy] in Somalia on a way forward”. “But this is only a first step,” said Daphne Eviatar, a director at Amnesty International USA, in a statement.